Since 1996, BargaJazz has offered concerts, master classes, and workshops for the public in the medieval town of Barga located in the province of Lucca. The biggest names in jazz gather once a year to share their music with each other and the public, making the festival the perfect platform for up and coming musicians to get their start. To celebrate its 30th anniversary, the festival welcomes pianist and composer Franco D’Andrea to perform and speak at events throughout series. Though the festival will run as normal, funding for BargaJazz is in jeopardy this year and festival organizers are unsure whether they will receive money from the state until September (after the festival has already begun), said Alessandro Rizzardi, the president of the BargaJazz Club. BargaJazz kicks off the 2016 festival with a concert in the historic center of Barga on August 21 at 6 pm with Barga InJazz and other street bands that will perform in squares throughout the city. This inaugural concert is free and open to the public, though following concerts will not be. According to Rizzardi, the purpose of Barga InJazz and these street concerts is to make jazz accessible and intriguing to both musicians and non-musicians alike. By expanding the performances to venues outside the traditional theatres, the entire town can participate in the festival. Another special concert is the saxophone quartet “Arundo Donax,” composed of Peter Tonolo (alto), Pasquale Laino (soprano), Mario Raja (tenor), and Rossano Emili (baritone). The group plays on August 24 at the cloister of St. Elizabeth at 9:30 pm. This year’s guest performer, D’Andrea, will headline at concerts and offer a master class during the festival, including a solo piano concert on August 25 in Teatro dei Differenti at 9:30 pm and a master class in Civica Scuola di Musica at 10 am on August 26 (master class admission is €50). Rizzardi said that past guest performers are musicians that everyone can recognize, even those outside of the jazz world. Though D’Andrea might not be a name anyone will know, it’s one that jazz musicians and aficionados will. Born in Merano in 1941, D’Andrea has played piano since age 17 and began professionally studying music in Rome in 1963. Since then, he’s worked with several groups over the course of his career, mostly recently a sestet as well as a quartet that he currently leads. He has played with Dexter Gordon, an American tenor saxophonist who died in 1990, Pepper Adams, an American composer and jazz baritone saxophonist, and countless other loved jazz musicians. Among the other groups performing during the festival is La BargaJazz Orchestra, founded in 1989 and currently under the direction of Mario Raja, a saxophonist, arranger, and composer who began his studies in Rome. The group will perform its first concert August 26 in Teatro dei Differenti at 9:30 and again the following night along with D’Andrea. The festival will also present BargaJazz Contest, an annual competition dedicated to works by newly emerging musical groups composed of three to seven members. Groups are able to submit applications before the festival and a collection of judges narrows the applicants down. 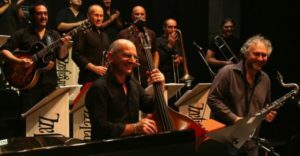 The winning original compositions will be interpreted by the BargaJazz Orchestra on August 26 at the Teatro dei Differenti (9:30 pm). BargaJazz finishes on August 27 with a concert by the BargaJazz Orchestra featuring D’Andrea, under the direction of Mario Raja. In Teatro dei Differenti at 9:30 pm, the group will play music composed by D’Andrea, as well as the best arrangements of the BargaJazz Contest.